Welcome back to the Top 40 Countdown! If you missed the previous posts, you can go ahead and check out songs 40-31, and 30-21. Once again, this has been a great week of discovering music, for me. Today is another great mix of songs. So, let’s Return to the week ending January 12, 1985, and move on with the countdown. Wow, Spandau Ballet did songs other than “True”?! I actually like this one better. This is a cover of George and Ira Gershwin’s popular song from the 1935 opera Porgy and Bess. It has been covered many times, including this version, from Bronski Beat’s debut album, which reached up to #16 on this chart. The novelty act, Black Lace, is back with another hit! This is similar to Buster Poindexter’s “Hot, Hot, Hot“. I guess Black Lace was really trying to get the Wedding Reception circuit. Sal Solo had been the lead vocalist of Classix Nouveaux, as part of the New Romantic movement. He embraced the Roman Catholic faith after a pilgrimage to San Damiano, a small village in Italy near Piacenza. He began a solo career, scoring a hit with this song, which would peak at #15. After 1987, Solo stopped recording music commercially, and became active in youth ministry in the Catholic Church in the UK. Here is the song from Chess that I did know about already, and love! Murray Head raps the verses and the chorus is sung by Anders Glenmark, a Swedish singer, songwriter and producer. For fans of the Buffy the Vampire Slayer television show, Murray Head is the brother of Anthony Stewart Head, who played Giles. Smiley Culture was a reggae rapper. We did not hear this style music in the U.S. at this point. This was the supposedly autobiographical tale of how Smiley Culture was arrested for the possession of cannabis, but then let off in return for an autograph when the policeman recognized him as a famous reggae artist. In a cruel twist of irony, Smiley Culture died at the age of 48 in 2011 during a police raid on his home. Nik Kershaw was huge in the U.K. through the mid-80s. He did not break through in the U.S. Most likely, U.S. audiences would mainly have seen him from his Live Aid performance in Wembley. This was the first song released from the album Here’s to Future Days. It peaked right here at #13 in the U.K., and reached #14 on the U.S. charts. This song and “King for a Day” are my favorite songs by The Thompson Twins. And both songs are from the same album. Great song from the Emergency album! I owned the cassette, and the whole first side is flawless, in my opinion. I love the funky R&B sound of this song. It peaked at #11 here, and cracked the Top 10 in the U.S., peaking at #9 there. My long-time readers and podcast listeners know of my love of rap, and how I loved to break out the cardboard and boom box, throw on my parachute pants, and throw down some break dance moves. Well, this is right in my wheelhouse! I love how the Chaka Khan/I Feel For You rap got mixed in here too. That wraps up today’s list of songs. I think this is the best list so far! Come back Friday as we see what the Top 10 songs were this week in the U.K. in 1985. Hi Everybody! Welcome back to the countdown! If you missed yesterday’s list of songs, you can go ahead and check them out. Where were you at this time in 1985? I was 14 and midway through my first year of high school. The beginning of the school year was exciting. I went to a catholic school from 2nd through 8th grade. Then I went to a good size public school for high school. The change was exciting. I got to go to a different classroom for every class, and I didn’t have to wear a uniform! However by this point, the newness wore off, and I wasn’t liking school too much, and didn’t do to well. Even though I wasn’t enjoying school at all, this was still a great time for music, movies, and TV. There will be a few familiar songs on today’s list of songs that bring us back to that great time of music. For my good friends in the U.K., there may be even more songs that bring you back to that time. Now let’s Return to the week ending January 12, 1985, and either relive, or discover the great music of that time. Before this artist became known as Alvin Stardust, he was known as Shane Fenton. He had success in the pre-Beatles era, hitting the UK top 40 with four singles in 1961–62. However, he became better known in the 70s and 80s with his Alvin Stardust persona. This song had reached up to #7 on the U.K. charts. In a poll for Q magazine in 2003, a panel of music writers voted “Agadoo” as the worst song of all time, saying: “It sounded like the school disco you were forced to attend, your middle-aged relatives forming a conga at a wedding party, a travelling DJ act based in Wolverhampton, every party cliche you ever heard.” The panel also described it as “magnificently dreadful”. No wonder I like this so much! I’d be one of those middle-aged relatives forming a conga, to this train wreck of a song, at a wedding reception. When I first saw the song title, I thought this was going to be a Beatles cover. Instead, this is a very good power ballad. Here is a throwback song by the Welsh singer. This sounds like it came right out of the ’50s. It makes sense that this was a hit, as there was a lot of nostalgia for the 50s and 60s in the 80s. Very cool funk/R&B song. Council Collective was a collaborative effort put together by The Style Council. It was put together to raise money for striking miners. The proceeds also went to the family of David Wilkie, a Welsh taxi driver who was killed during the miners’ strike. This song was my introduction to Chaka Khan, and was a big comeback hit for her. It has an iconic introduction by Melle Mel of Grandmaster Flash and the Furious Five. Oh by the way, this was written and originally performed by Prince. But, Chaka Khan made it her own, and was a smash hit in the U.S. and U.K. It also won Prince the 1985 Grammy Award for Best R&B Song, as the songwriter. To say that this was a smash hit, is just putting it mildly. This was Stevie Wonder’s biggest hit, topping a record 19 charts. This was one of those cases where the song was much bigger than the movie that it was featured in. In this case, it came from the 1984 soundtrack album The Woman in Red. This was actually Wonder’s only #1 hit in the U.K. He made it count though, as it topped the charts for 6 weeks, and it became Motown Records’ biggest-selling single in the UK, a distinction it still holds today. This is the third song in a row that we all know. This was the first cassingle I ever owned. Whenever I hear this song, the Mad Max type video of this song comes to mind. Well, I learned something new, which I probably should have known. This song is from the album 1984 (For the Love of Big Brother), which was the soundtrack from the film Nineteen Eighty-Four. I never knew there was a soundtrack for that movie. I’m pretty sure I saw the movie, but I don’t remember it. There’s no need to go back and watch it, seeing that we are living it now. Great soulful song by the awesome Yazoo singer. In my opinion, she is very underrated (at least in the States). Well, that wraps up today’s list of songs. They seem to be getting better and better! What do you think so far? Also, feel free to email me at returntothe80s@gmail.com if you would like to make a long distance dedication. We’ll continue the countdown tomorrow. Hi Everybody! Welcome back to this week’s countdown! If you missed the previous songs, you can go back and check out songs 40-31. At this time in 1985, I was in the middle of the 2nd quarter of my Freshman year of high school. Indoor track was in high gear. This also means I was doing horrible in school. For some reason, the 2nd quarter was always the time when I got my worst grades. Maybe it’s because the freshness wore off by now. Then the last 2 quarters I had to buckle down to get my grades back up. Why the hell am I talking about school?!? Let’s get to some music! Now, let’s Return to the week ending January 19, 1985, and continue the countdown. Oh-we-oh-we-oh! Great start today, as we get our funk on, riding high with Morris Day and The Time from Purple Rain. Great song by one of the greatest singers of all time. Boring video. Back to some Funk to get us moving! This was Midnight Star’s only top 40 hit. Power ballad and big hair. Perfect ’80s combination! Solid. Solid as a rock. That’s what this song is. If you like Bob Seger, you’ll like this song. If you don’t like Bob Seger, it’s understandable that you don’t like this song. This song from The Woman in Red may have flown by you as the airwaves were being flooded with “I Just Called to Say I Love You”. Classic song by the best duo of the ’80s. Do I have to spell it out for you? 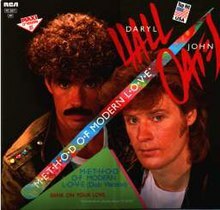 Hall & Oates are so soulful that T-H-E-Y C-A-N S-P-E-L-L T-H-R-O-U-G-H T-H-E E-N-T-I-R-E S-O-N-G A-N-D I-T W-I-L-L S-T-I-L-L S-O-U-N-D G-O-O-D.
That wraps up today’s list of songs. What do you think so far, now that we are halfway done? Come back tomorrow as we continue the countdown. Welcome back to this week’s Countdown! If you missed the previous songs, you can go ahead and check out songs 40-31, 30-21 and 20-11. Well, I think this has been a really solid countdown this week. And there are going to be some ’80s classics in this Top 10. So, let’s Return to the week ending March 9, 1985, and wrap up this week’s countdown. Once again, a great way to begin the countdown today! This is one of my favorite Kool & the Gang songs. This was off of Kool & the Gang’s biggest selling album, Emergency. I love Sheena Easton, but this isn’t one of my favorite songs by her. It does have that classic ’80s synth-pop sound though. This song was composed by Prince, and you can totally hear it. This classic power ballad by Foreigner was a #1 hit. It was also overplayed. But, after avoiding it for a while, it sounds good to me again. 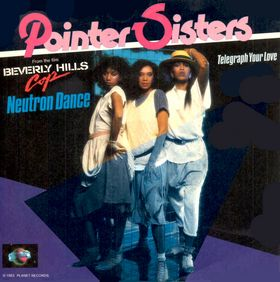 This is a great fun song by the Pointer Sisters, with Ruth as the lead singer. It was included on their great album, Break Out. 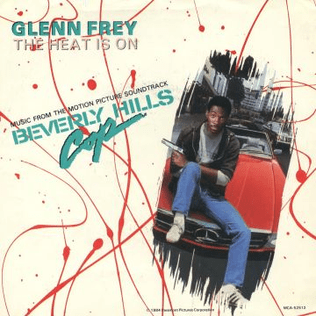 However, it’s inclusion on the Beverly Hills Cop soundtrack may have helped it become a huge hit. The song went so perfectly with the awesome chase scene at the beginning of the movie. 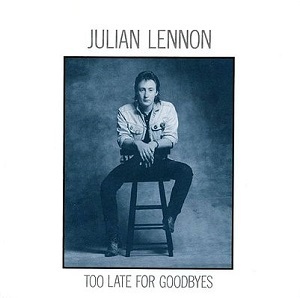 This was Julian Lennon’s biggest hit. I could not get over how much he looked and sounded like his father, John. Back then, I was kind of hoping the Beatles would reunite, with Julian taking his father’s place. But, I could not even imagine the pressure he already must have felt. So, that may have been unfair to him. I kind of like this song, and it really brings me back. I do love me some classic Madonna! I even had a little crush on her back then. It was nice when she was relevant. By the way, did you know she has a new studio album out? I didn’t, until I just went to iTunes for something else. Oh well. After this song, Madonna would sometimes be called the Material Girl in the headlines of newspapers and magazines. She did have a hit with “Like a Virgin“, but I notice she was never called Virgin Madonna. Anyway, “Material Girl” helped play a big part in helping Madonna become a pop icon of the ’80s. I loved this song when it came out! 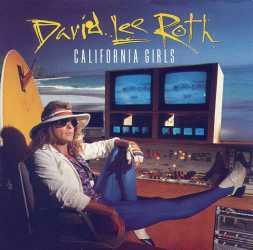 I much prefer DLR’s rockin’ music, but this was fun. He always has the strangest characters in his music videos. Another ’80s classic! And another smash hit from Beverly Hills Cop. This song would top out at #2, being held off by this week’s top song. However, it is the highest U.S. charting solo single by any member of The Eagles. Now is the time of the countdown where we find out what was topping the other charts this week in 1985. Topping the R&B charts was our #34 song on the Hot 100 – “Missing You” by Diana Ross. The top Rock song this week was our #25 hit on the Hot 100 – “Just Another Night” by Mick Jagger. The top Dance tune was “New Attitude” by Patti LaBelle. This was George Michael’s first solo hit, although he was still performing in Wham! at the time. The song was on Wham!’s Make It Big album. This is one of those songs that I did not like at all when it came out. But, I like it now. 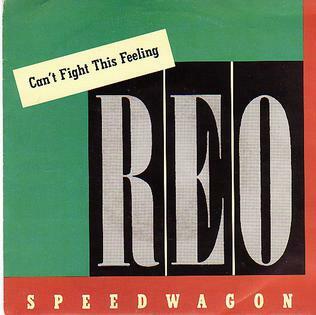 We have reached the top of the charts with this classic power ballad by REO Speedwagon. This was the first week of this song’s run as the #1 hit in the country. If you see any ’80s love song compilation, chances are very good that this song will be on it. David Lee RothForeignerGeorge MichaelGlenn FreyJulian LennonKool & the GangMadonnaPointer SistersREO SpeedwagonSheena EastonWham! Welcome back to this week’s Countdown! If you missed the previous songs, you can go ahead and check out songs 40-31 and 30-21. Well, as Casey used to say, the smaller the number, the bigger the hit. As we move on down the countdown, we will find more and more true ’80s classics. I hope you are enjoying this trip down memory lane as much as I am. Now, let’s Return to the week ending March 9, and continue the countdown. Yes, we begin the countdown with one of the best duos of the ’80s giving you an earworm! This is a good song to have stuck in your head, but not when there are 9 more songs to go today! OK, time for a palette cleanser. 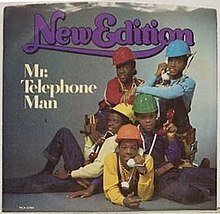 Before New Kids on the Block, New Edition was the big boy-band of the ’80s. This song isn’t too bad. It was written by Ray Parker, Jr. Journey was one of my favorite bands of the ’80s, and I love this song by them. It was originally intended to be on the Frontiers album. But, it was pulled in favor of the songs “Back Talk” and “Troubled Child“. 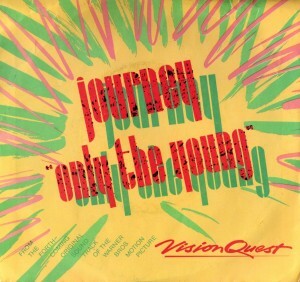 It eventually was included on the Vision Quest soundtrack, was released as a single, and cracked the Top 10 on the Billboard Hot 100 chart. Frankie Goes to Hollywood, had a short,but great run in the ’80s. “Frankie Says” t-shirts were seen everywhere in the mid-80s. What happens when you put together the lead singer of Genesis with the lead singer of Earth, Wind & Fire? Total awesomeness!! This fun duet won an MTV Video Music Award for Best Overall Performance in a Video and was nominated for a Grammy for Best Pop Performance by a Duo or Group With Vocals. Tina Turner had an incredible comeback in the ’80s with her Private Dancer album. This title track was the 5th single released from that album. It was written by Mark Knopfler of Dire Straits, and was actually meant to be on their album Love over Gold. However, Knopfler felt that it wasn’t suitable for a male to sing, so it was not put on the album. Tina Turner took it and ran with it. 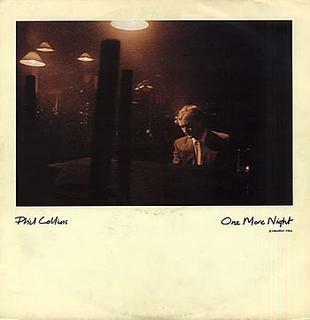 Phil Collins is back again – this time with a solo song. This would go on to be his second #1 hit (after “Against All Odds“). This is a nice slow song from his No Jacket Required album. 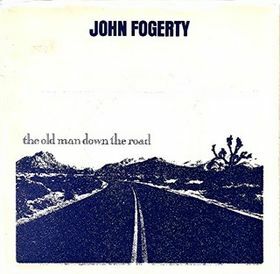 This was the lead single from John Fogerty’s comeback album, Centerfield. It became a top 10 hit, peaking at #10 on the US Billboard Hot 100, and was a #1 hit for three weeks on the Billboard Top Rock Tracks chart. This song is just classic Fogerty. As far as I’m concerned this is a very underrated song that does not get enough airplay. 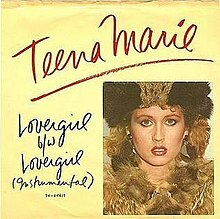 “Lovergirl” would be Teena Marie’s biggest hit, peaking at #4 on the Billboard Hot 100. I love Billy Ocean, and this is a great, fun, upbeat song. I hope you are all enjoying this countdown from the heart of the ’80s. On Friday, we’ll be back with the Top 10 songs. See you then!